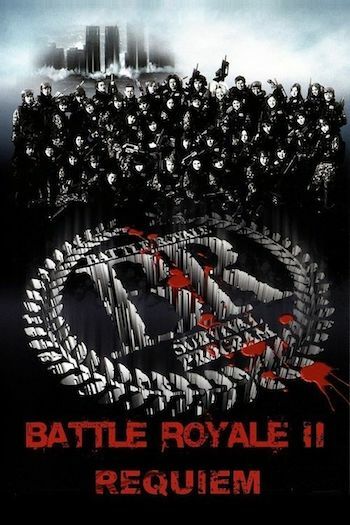 Those of you new to this Battle Royale stuff need to check out the first one. Not because it’s necessary to understand or enjoy the second (heck, I saw the first one and I still didn’t know what was happening in this one), but because it’s a whole lot better, or at least, it’s more focused. Plus, in the first one you get lots of Beat Takeshi, while we’re relegated to about ninety seconds of Beat in cameo-flashback mode here. I had a sneaking suspicion that somehow this movie would end up being some anti-American diatribe when it started by showing a pair really tall buildings collapsing and unfortunately this is the part of the movie that didn’t let me down. It’s the act of a band of terrorists lead by Shuya Nanahara. Shuya survived the first Battle Royale game and used that victory as a launching pad for his new career as violent psychopath who has declared war on all adults. So what is it that’s put a burr under this kid’s saddle? I think he’s still a bit miffed by his whole Battle Royale experience. The BR Act was enacted by the Japanese government to deal with all their bratty kids back at the turn of the century. It created the ultimate reality show by taking one ninth grade class, putting explosive devices on their necks, dumping them on an island, arming them, and telling them that the only way the game ended is when everyone is dead except one of them. Now with Shuya on the loose, the Japanese government has no option but to call in their most potent secret weapon – another ninth grade class! When we meet our gang of malcontent teens, they’re on their way home from a hard fought rugby game and everyone is on the school bus signing the ball like it’s a yearbook. How many times do you think we’re going to have see that dang rugby ball in the movie whenever someone buys it? Later on they wake up and discover that they all have these collars on and that they’re at a secret military base. They’ve been selected to participate in the latest Battle Royale game! The new evil teacher character is Riki and he quickly had me missing Beat’s homely looks and unflattering track suits, as well as his obsession with eating cookies. 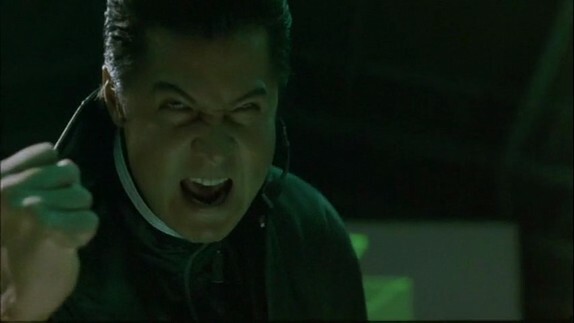 Riki has this slightly Wayne Newtonian look about him with his fancy black hair and his wardrobe choice of wearing a black trench coat didn’t give him the bad guy authority look so much as the out-of-style pimp look. He also was prone to giving speeches about how there are only two sides in life: the winners and the losers and which one are you on? I’m guessing that he must have been this ninth grade’s P.E. teacher. He also popped amphetamines instead of cookies. This time around, the kids have a different mission. Instead of killing one another, they are charged with storming the island stronghold of Shuya and wiping him and his cell of terrorists out! Does this strike anyone as a gimmick for gimmick’s sake? What reason is there to do this? Doesn’t Japan have a Delta Force? Or some cops? Or some grown ups? And can anyone tell me what any of this has to do with Riki’s diatribe where he lists all these countries that America has bombed in the last couple of decades? Each and every one of those countries had it coming, needed liberating, or harbored commies! I’m telling you, the only reason I stuck through this pud’s trashy cheap shots was because I knew we were only moments away from about ninety straight minutes of punk kids dying horribly graphic deaths. And once our forty or so anonymous student/special forces team hits their rubber rafts and go speeding toward’s Shuya’s island hideout, the kids start dropping like flies. As expected, Shuya seems pretty sympathetic to these kids, especially once he deploys his EMP weapon that disables the collars. You don’t have to actually sit through this movie to know that the new band of ninth graders will join up with the old ninth graders against the adults that are finally en route to the island. After a mysterious nation launches a couple of missiles at the island (I don’t know who it was for sure, but I’m guessing its initials were U.S.A.), the Japanese prime minister declares that they need to send their own troops in there to clean up the mess themselves. This angers Riki for some reason, further pointing out this film series’ stupidity of having disgruntled high school teachers in charge of sensitive military operations. The rest of the movie is then simply a battle between the kids and the adults, which sounds good on paper, but since I had no idea who any of these kids were, it all had very little impact on me. Kenta Fukasaku took over the directing duties for his father Kenji who died during filming, and the movie looks and sounds quite good. The problem is the age old one of style over substance and while the first one suffered from that as well, this one is hurt by it more substantially because the story is just not very well thought out. All of this mush headed babble about kids vs. adults mixed in with the anti-American crap and post-September 11 stuff never added up to much and certainly didn’t explain what in the world the Japanese were doing sending a bunch of high school kids off to kill terrorists on an island. This was the sort of movie where after all this talk about war and peace and evil countries and winners and losers, the teacher shows up on the island dressed in his rugby outfit carrying that rugby ball and he says he wishes that his students had asked him to play with them. Then he tells them to get out and he dives over to somewhere and everything starts blowing up. Funny? Yes. Memorable? You bet. Was I finally able to make heads or tails over what was happening? Of course not! An ill-conceived sequel riding the coattails of a predecessor that was overrated to begin with.